Mercy Ministries News: Look What Our Supporters Did In 2013! Look What Our Supporters Did In 2013! As we enter our 30th year of ministry, I want to thank you from the bottom of my heart for being such a vital part of our team. You make a way for hurting girls to get the help they need, free of charge, when they wouldn’t be able to afford it otherwise. You have truly blessed them, and you have truly blessed us! • Our Intake Department fielded over 14,000 phone calls and received more than 1,100 applications from across the U.S. and internationally. • We launched a new weekly podcast series, “MercyTalk with Nancy Alcorn” (www.MercyTalk.org), which allows us to bring a message of hope and healing to a global audience. • Mercy Ministries maintained our certification by the Evangelical Council for Financial Accountability (ECFA). In addition, I was selected to serve alongside Franklin Graham, Dr. Jack Hayford and other prominent Christian leaders on ECFA’s Board of Reference, an advisory panel that supports ECFA leadership in its mission to help Christ-centered, nonprofit groups maintain financial and ethical best practices. • We received our fourth consecutive 4-star rating from Charity Navigator. According to Charity Navigator, only 6% of the charities they rate receive this distinction. • I had the great privilege of serving on two international mission trips, one to El Salvador and the other to Uganda (in the same region our Mercy graduates ministered to in 2011). In April, I traveled to El Salvador for a series of women’s conferences hosted by Pastor Debbie Lindell and her James River Assembly team, which included two Mercy graduates! In June, I joined Gary and Marilyn Skinner, founders of Watoto Ministries, in Uganda. There I spoke to hundreds of high school students and to Watoto Church’s 20,000-member congregation. I was also able to minister to the many brokenhearted women and children of Gulu, an area once controlled by Kony and his brutal rebel army. • I was thrilled to write a new book that contains some of the powerful principles God has taught me at Mercy over the past 30 years. “Mission of Mercy: Allowing God to Use You to Make a Difference in Others” will be published by Charisma House and released in May 2013. Please see MercyMinistries.com/MissionofMercy for details and advance ordering. • Throughout 2012, Mercy Ministries continued to provide life-changing programs for young women throughout the world, including transitional care services for Mercy graduates. We watched time and time again as young women entered our homes hurting and later graduated completely transformed. It is my prayer that this letter encourages you that your giving makes a life-changing difference. Thank you again for your heart for this ministry and your faithful support. We believe that with your help, we can reach even more hurting girls with the love of Christ in 2013. We thank God for you! P.S. I hope you’ll join us in Nashville on June 14th to celebrate our 30th Anniversary! 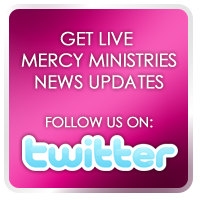 Visit www.Mercy30th.com for details.